It’s a mouthful; a seriously delicious mouthful. Have you ever made something using techniques and ingredients you always use, but you put it all together in a way that is startlingly new and delicious? Like...take a step back and pat yourself on the back, delicious? That happened to me this evening when I made this super simple pasta dish. I use the term “simple” rather liberally here given that there are a few pots and pans involved, but there is very little prep time. 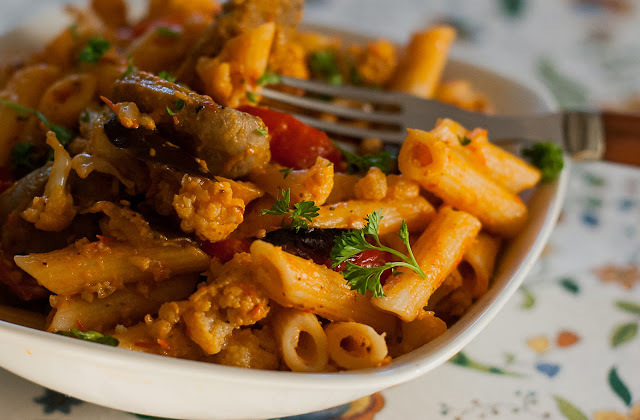 It doesn’t get any better than this; roasted classic italian vegetables with slices of fresh sausage, al dente penne pasta, and fresh tomato dressing all folded together. This fresh tomato dressing alone is a quiet masterpiece. If you have a few ingredients on hand, you can whip it up in no time flat to drizzle over a fresh spinach salad, warm noodles, or even slather it in a sandwich. I made it for the first time when I was in Key Largo last month, and everyone gave it rave reviews. If you try anything at all, try the dressing! That is a demand, not a request. Please and thank you. Preheat the oven to 375 degrees. Toss cauliflower, red pepper, and eggplant with olive oil, salt and pepper. Spread out in an even layer on two sheet pans (this gives the vegetables room to roast. Don't over-stuff the pans or the vegetables will steam instead of brown). Toss in sliced sausage. Roast, tossing occasionally, until the vegetables are tender and caramelized and the sausage is cooked through; about 30 minutes. Meanwhile, combine all of the dressing ingredients in a blender until creamy and smooth; set aside. Prepare pasta according to package directions. In a large bowl, toss hot pasta with half of the dressing; set aside. Toss the pasta, roasted vegetables and sausage, and the remaining dressing together. Serve warm or at room temperature. Cook's note: You can make this a vegan pasta dish by omitting the sausage. It would be just as flavorful, but add about 1/4 teaspoon more salt and 1/4 teaspoon more italian seasoning to the dressing to balance the flavors. What a beautiful bowl of comfort food. We love pasta with sausage for dinner here... love your fresh tomato dressing. YUM!! This looks terrific - I get tired of heavy tomato sauces in the summer. Might have to make it later in the year, once my tomatoes have appeared. It looks fantastic! This is my kind of food. Yup, I need to make this...and soon!!! Sounds like a perfect pasta dish to me! Yummy! Absolutely delicious! Stunning dish.